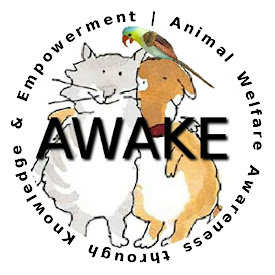 AWAKE CENTRAL: LEARN THE DIFFERENCE BETWEEN ANIMAL RIGHTS AND ANIMAL WELFARE! LEARN THE DIFFERENCE BETWEEN ANIMAL RIGHTS AND ANIMAL WELFARE! IF YOU HAVE TROUBLE READING THIS PAGE, GO HERE. Welcome! This page is continually undergoing construction, changes, additions, and improvements. Please stop back in, and feel free to link to or print out this page. Do you donate money to animal charities? This page is designed as an educational tool so that you will know whether or not the group you choose to endorse/join/support/contribute to holds the same beliefs, agenda and goals that you do. to frighten them from drinking milk. of the radical animal rights group. snacks helped them to maintain body heat. health or caused extreme discomfort. horses in the way that many people are. when used for the animal cause." The Animals' Agenda, Vol 15 #3. Society, Winter 1990, p. 357.
not behind that kind of trade off." it wouldn't make any difference to me." Angeles Times, April 12, 1990, p. E12. as quoted in Fred Barnes, "Politics,"
Vogue, September 1989, p. 542.
diseases we are heir to." --Tom Regan, as quoted in David T.
The Case for Animal Rights, 1983). his treatment was first tried on a dog,"
"I don't see myself as a hypocrite. Dogs Be Kept As Pets? NO!" Good Dog! February 1991, p. 20.
of Animals (PeTA), 1982), p. 15. Us? Toward a Notion of Animal Rights"
(symposium), Harper's, August 1988, p. 50.
brought about by human manipulation"
this whole notion of pets altogether"
pursue their natural lives in the wild"
deal to fear from the AR movement. and provided no charge is made. Rights Groups Show Us the Money! adequately feed and care for them? destroyed for lack of a home? valuable a service could they provide? needed for a less painful death. condition of one local humane shelter. now serving a 57 month jail sentence. in bonuses to the pair. programs for elephants and deer. to help shelter animals, who need it most? needed to sell their view in the long-term. rights groups show them the money. rather than PETA's "naked celebrity"
budget is allotted to staff salaries. and about 2 or 3 others. No full board at all! shelter with a high euthanasia rate in VA.
local humane society shelter here in Rutland, Vermont. and I plan to watch their future activities carefully. administered to dehydrated animals. The percentage of successful rescues versus the very few animals lost was astounding. provide veterinary support for the search and rescue dogs. was worthy of monumental praise. behalf of an abused 9-year-old girl named Mary Ellen. horses that got stuck in the mud or fell into the river. previously performed by New York City government. care for the 934,000 horses that served in World War I.
over the new communications medium: radio. exhibit at the New York World's Fair. animals in the event of air raids. classes for dogs and their owners. research -- the first program of its kind in the country. takes over this work in 1994.
its first open-heart surgery on a dog. animal handlers working for research institutions. his positive depiction of animals. compulsory spay/neuter for all animals. being adopted across the country. rescue groups across the country. negative impact on their grade. for the New York metropolitan area. clinical veterinary institutions in the world.